In this tutorial we will create some awesome text animation effects using a new feature in Photoshop. This is called the Video Timeline. It is like the Frames animation, but much more flexible to use. So we will focus on animating text using the Photoshop animation Timeline feature. The Animated output will be saved to a GIF file like the one embeded here. 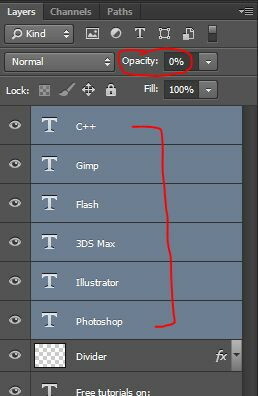 Photoshop Timeline animation is relatively new (CS5 Extended, CS6, CC), but gives you a lot more options than the old frame animation. 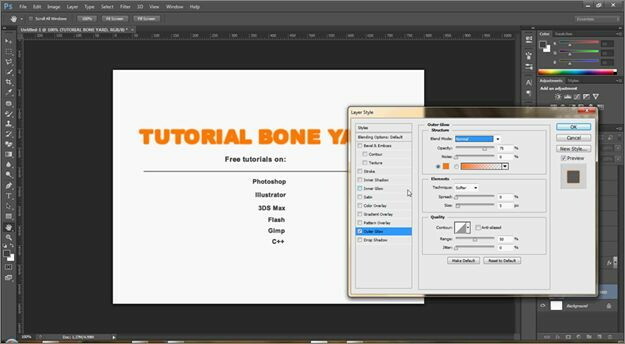 You can switch a frame animation into a timeline animation or vice versa in Photoshop. Timeline animation uses layers which have properties you can change like transform, opacity, layer mask position, etc. This gives you much more flexibility when creating an animation. To open the timeline go to Window > Timeline on the menu. You have the option to open a Frame Animation or a Video Timeline. * Set up text layers for a Timeline animation. * Use Opacity and Transform to create a fade in / out text effect. 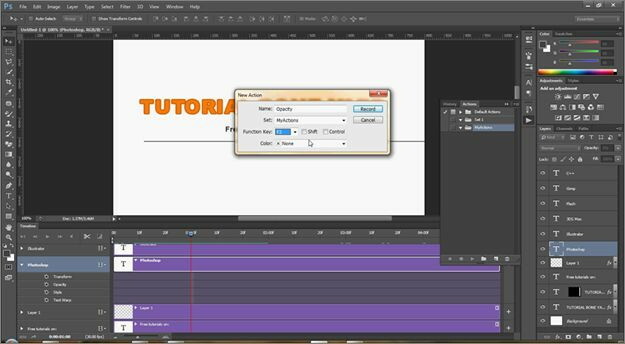 * Use the Layer Mask Position to animate colors in the text title. * Learn to use Actions to repeat the same animations in multiple text layers. 1. Create a new document of 800x600px. Now set up your texts in different layers. 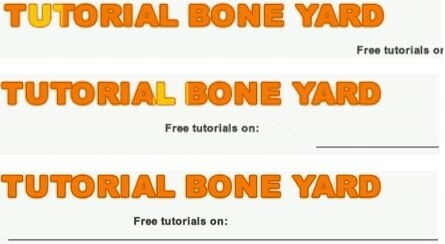 I have a main title of TUTORIAL BONE YARD, a sub title, dividing bar, some other texts, and a white background layer. It’s better to follow the same layout of texts in this tutorial. These are the layers for this project. 2. Now change the color of main title to #ff7e0c and go to Layer Styles. Add Outer Glow with same color and normal blend mode. Also add a Stroke with #be5a00 of 2px in center. 3. Now duplicate the text in a new layer. On the menu, go to Layer > New > LayerVia Copy. Then go to Layer Style, remove outer glow and stroke. Add Color Overlay with overlay blend mode and 60% opacity. 4. Now chose marquee selection tool and select an area like the image below. Make sure that the copied layer is selected. 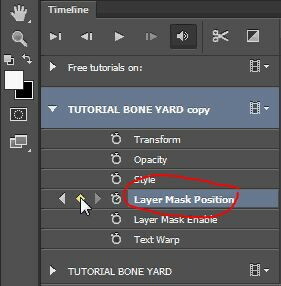 Create a layer mask from Layer > Layer mask > Reveal Selection. This will hide the duplicate. 5. You can see the duplicate layer and its mask below. You will see what the mask is used for in step 11. 6. Before moving on, change the Opacity of the text layers above the divider bar to zero for now, so we can concentrate on the Title and subtitle animations. 7. Go back to the original title text layer. Now open the timeline panel from Window > Timeline. Click Create Video Timeline. 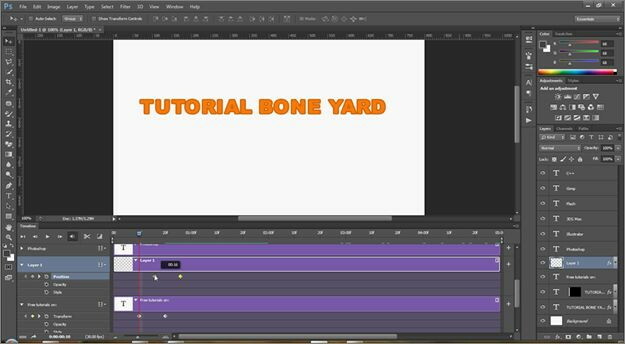 On the timeline, click on the arrow of the left side of the main title’s layer to open keyframe control. Now you have contol over the animation of Opacity, Transform and others. You can also move the frame slider to different points on the timeframe and insert keyframes. 8. Move the frame slider to zero. 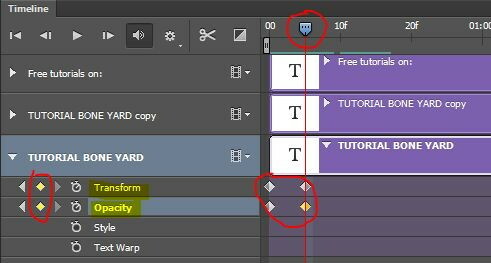 Click on the Transform and Opacity keyframe buttons circled on the left. Go to 5th frame, set two more like you see below. 9. 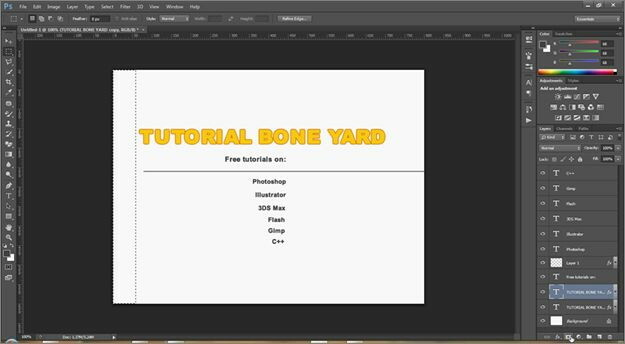 Stay on Frame 1 and the TUTORIAL BONE YARD layer. While holding SHIFT + ALT, Transform the text layer to a small size (Edit >> Free Transform). Apply the transformation. Stay on Frame 1 and set the layer opacity to 0%. Now move the frame slider from frame 1 to 5 to test the animation. NOTE: watch the video if you have any problems here. 10. Now go to copied layer (the one with the mask), click on layer mask position and make 6 keyframes spaced out. 11. Ok, make sure the copy layer has the lock turned off next to the mask. Now click the Move Tool button so we can move the mask at different points in the timeline animation. 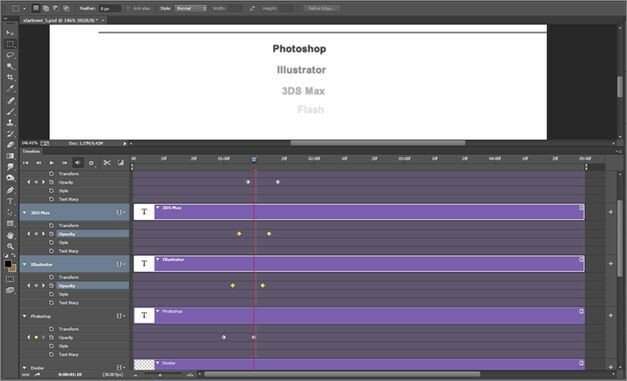 Move the timeline slider to the 2nd keyframe you just made on the layer mask position. Now with the Move tool on, go to the screen and drag the mask from left to the right. You will see the glow of the letters from the copy layer as you drag horizontally. WATCH THE VIDEO if you have trouble here. The mask layer will flip horizontally. Do the same for also 4th and 6th keyframe. Test the animation. 12. For the subtitle and divider layer we will just make an animation to slide them from outside the canvas, and then back into place. 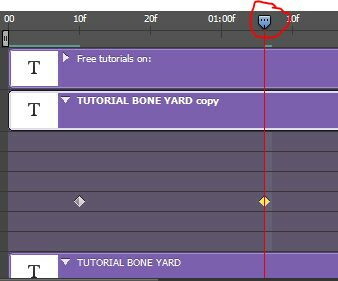 Just make keyframes in position in 10th and 20th frame. Now go to 10th frame and move the layer to the out of the canvas so that it becomes invisible. WATCH THE VIDEO if you have problems. 13. For the other layers, we’ll just make the “fade with opacity“. As we have a lot of layers here, I’ll use Actions to make it easier. Go to Actions panel from Window > Actions. 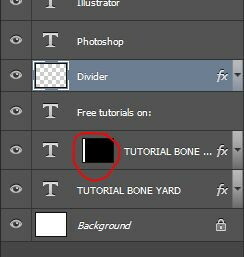 Before creating any action, select the first layer which you want to animate in fade style (the Photoshop text layer). Create new actions set and name it “MyActions” and create new action and name it “Opacity”. From now what you’re doing is being recorded as actions. The record button is now on. 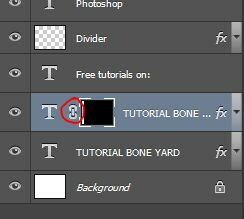 Be careful to only do changes in the layer you selected. 14. Move the slider below and create 2 keyframes in Opacity like you see circled below. Go to 1st keyframe and set the layer opacity to 0%. Go to the 2nd keyframe and set layer opacity to 100%. Our action is completed. Now click the stop recording action button in the actions panel circled on the right above. Test the “fade in” animation. 15. Now we’ll apply this action to all of the remaining text layers. 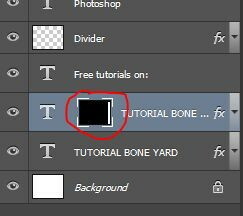 Select the next layer (Illustrator text layer), select the action Opacity in actions panel and click the start action button circled below. What now happens is that the same steps in the first actions layer is repeated in this one. This saves you time because you can quickly insert the actions of the first layer into all the rest (one by one). Do this for all the remaining layers. 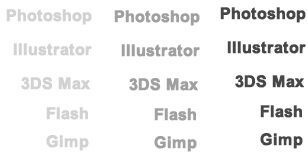 Now all these text layers have the fade with opacity settings. 16. Basically, Actions have stored the data of these layers. So after applying all actions, we’ll see that all of the layers are fading at same time. To make them fade one by one, just select every two keyframes of every layer and drag them after the starting point of previous layer. Follow the image below. To save it to a GIF file, on the menu go to File >> Save for Web. Save as a GIF file. If you do not have that many colors, you can drop it to 128. A small size is preferable on a website. Congratulations! Your timeline animation is complete. Thanks for using our Photoshop tutorials! !